Turkmens fleeing the Bayırbucak region on their way to Turkey. More than 6,000 Turkmens and Arabs have so far fled the Turkmen-populated Bayırbucak region of northwestern Syria and received shelter from Turkey after advancements by Russia-backed regime forces. Turkish officials in Pulluyazı, a village near the border town of Yayladağ, in Hatay, have closed the border crossing point after taking all 6,061 migrants late Monday. Officials from the Disaster and Emergency Management Authority (AFAD) built a 10,000-capacity refugee camp and refugees, Arabs from Jisr al-Shougur, are relocated to the camp. Furthermore, early yesterday, regime forces started heavy bombardments of Turkmen Mountain and the Jabal al-Akrad regions, as Russian aircraft helped through targeted offensives. 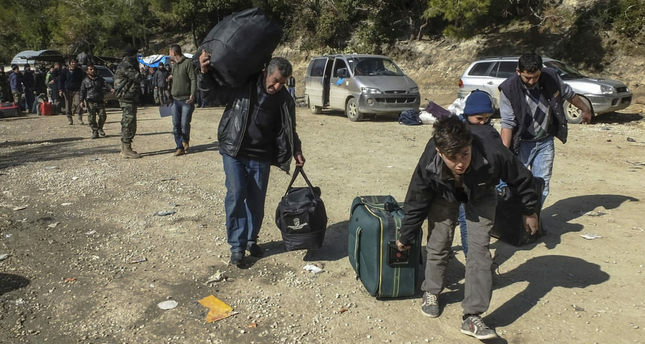 Previously on Monday, AFAD said that some of the refugees have been transferred to AFAD-run camps in the provinces of Hatay, Gaziantep and Şanlurfa, while others are finding their relatives, thanks to biometric registration processes. The refugee influx has accelerated since Jan. 24, when the rebel-held town of Rabiya, in the Syrian province of Latakia, was captured by forces loyal to the Assad regime. The Syrian government's military campaign came as the U.N. struggled to convene the first peace talks in two years in Geneva, where opposition representatives are seeking a halt to attacks on civilian areas, the release of detainees and a lifting of blockades. Russian airstrikes have killed nearly 1,400 civilians since Moscow started its aerial campaign in support of Assad nearly four months ago, the Syrian Observatory for Human Rights monitoring group said on Saturday. An opposition delegate said bombings had intensified before the peace talks. "There was an attack by Russians on the camp over the weekend," a Turkmen official at Yayladağı said. "Thankfully their bomb did not fall right in the heart of the camp, but 40 people were still wounded. A lot of towns and villages in the north of Latakia have already been emptied. But, there's still another 3,000 to 4,000 civilians there who haven't left. "AFAD said more than 150 refugees have been placed in a new camp in Güveçci, on the Turkish side of the border, while others have been sent to refugee camps in the Turkish provinces of Gaziantep and Şanlıurfa, which lie along the border with Syria. Some have found refuge with relatives. The Turkmens are an ethnic kin to Turks, and Turkey has been particularly angered by Russia targeting of them in Syria. Russia's actions in Syria risk exacerbating a refugee crisis, at a time when Turkey has just struck a deal with the EU to stem the flow of refugees to Europe.AFAD has provided over TL 500 million ($169 million) in humanitarian aid to Bayırbucak Turkmens, and says it is committed to continuing to provide support for Turkmens seeking refuge in Turkey. AFAD works collaboratively with the Ministry of Health, Gendarmerie General Command, the Turkish Red Crescent, and other institutions. Rural towns in a province traditionally seen as a stronghold of the regime were relatively safe until a military offensive over the last two months, including 300 air raids, unsettled the area. That was why people from these communities were now being displaced in large numbers, the United Nations said. At least 12,733 civilians have been displaced in two months of fighting, and more displacement is expected if pro-Assad forces advance towards Kensaba and along the Turkish border, a U.N. humanitarian report said. In southern Syria, a further 35,715 people have been uprooted by another government offensive to retake the strategic town of Sheikh Maskin, the U.N. said. "On average, since 2011, 50 Syrian families have been displaced every hour of every day," UNHCR said in its latest Syria report. Most of Syria's pre-war population have been forced out of their homes by the war, 5 million as refugees and 6.5 million displaced within the country.